A house near Hampstead Heath. Night. Two men in a room. Do Hirst and Sooner know each other or is each performing an elaborate charade of recognition? The ambiguity and the comedy intensify with the arrival of Briggs and Foster, the one ostensibly a manservant, the other a male secretary. All four inhabit a no man’s land between reality and imagination – a territory which Pinter explores with his customary wit and skill. Written in 1974, Harold Pinter’s No Man's Land has been brought to The Mill Studio, a venue at Guildford’s Yvonne Arnaud Theatre which presents plays and fringe theatre to an auditorium of around eighty. The Lighted Fools Theatre Company was formed in 2002 and No Man's Land is its 32nd production. 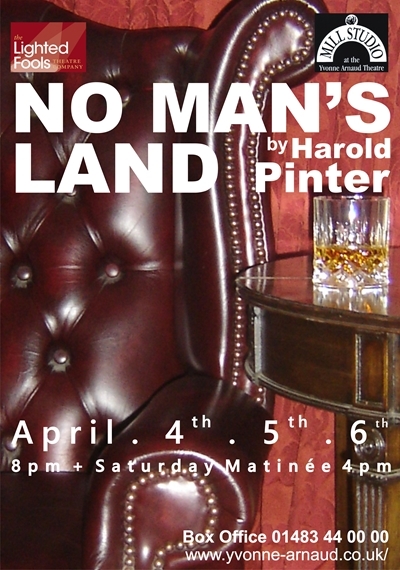 No Man’s Land begins with the audience dropping in on a conversation between two older gentlemen who seem to have just met that evening in a Hampstead pub. They are drinking heavily. Hirst, the owner of the house, and Spooner – who introduces himself as a poet – long-windedly explains how he is perceptive in all areas of life. As the drinking continues Spooner goads Hirst, pushing for and getting a reaction with Hirst throwing a glass in frustration. Soon after, Hirst collapses and crawls out of the room. The night grows more complicated when two younger men – Foster and Briggs – return to the house. They question Spooner who has suddenly gone very quiet. Hirst returns refreshed and unsure of the day. The intense conversations continue throughout the night and, the following day, we learn of many strange and surreal reminiscence of the four men's lives. 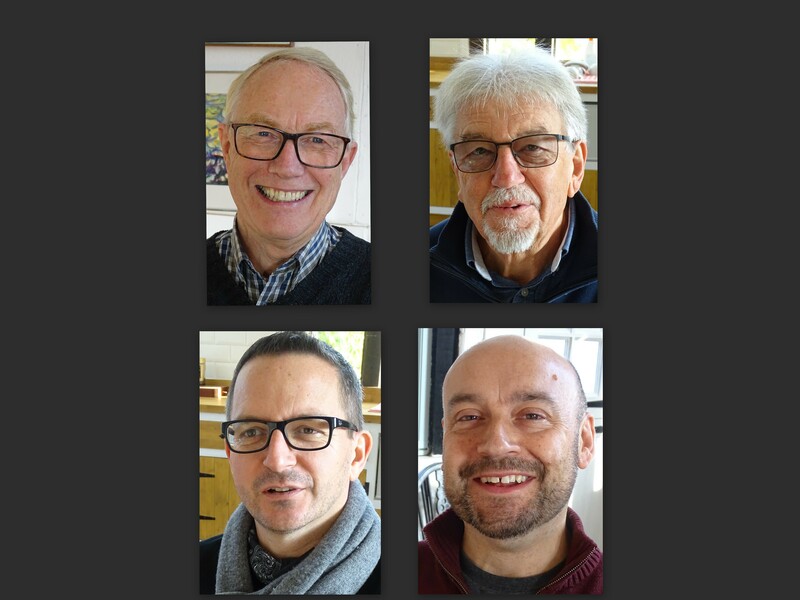 Lighted Fools’ quartet – Richard Parish (Hirst), Steve Alais (Spooner), Nick Lund (Foster) and David Webb (Briggs) – are believable and very competent in their roles. With such a small cast there is nowhere to hide and with actors performing near-monologues on occasion and for long periods of time, despite the subject matter being excessive and deep, respective acting skills keep the audience completely engaged and wanting more. Nick Lund also displays good awareness of comic timing making some quite serious moments humorous. That’s Pinter for you! I'm really impressed with the design and feel of the set which was arranged by David Hemsley-Brown. It's perfect for the script, realistic, and has all the elements of a stately home. This extends to costumes by Gill Parish, where the characters are instantly recognisable by what they are wearing and each person dressed in a creative ensemble. Director, David Hemsley-Brown, is clearly experienced in directing Pinter; I imagine this type of interpretation is challenging and complex but equally as rewarding. He has done an incredible job. This unique and bewildering play is packed with drama and confusion, and there is no definitive explanation of exactly what is happening. I believe it's down to you, the viewer, to make your own mind up. My opinion is it's a world between life and death and possibly mostly in the mind of one character, Hirst. But it leaves me with lots of unanswered questions. I could watch this play many times and come away with a different set of unanswered questions each time. This was a thought-provoking and thoroughly entertaining performance of an outstanding play. The play opens with two men and a blatant pick-up close to Hampstead Heath! Hirst (Richard Parish) has enticed a man back to his home and reveals himself as a dominant alpha male to Steve Alais' submissive Spooner but just as we position the 'arrangement' Spooner's intellect kicks-in and the question arises as to who is really in charge? It was an excellent performance and my friends were all very impressed! We felt it deserved a standing ovation not just polite applause! Congratulations on another wonderful production. I have no idea what it was all about but I thoroughly enjoyed it! I didn’t have a clue what the play was all about.... came to the conclusion that it was a dream sequence as suggested in the blurb...... but my admiration for Lighted Fools has risen even more! I enjoyed all the performances on Thursday evening and perhaps one day I'll understand the play! Pinter' s language is so precise and menacing and still has the power to shock. Several gasps around us! The set and costumes were excellent. Can’t say I enjoyed it but I’m glad that I saw it!